Posted on 2018-09-30 16:34:59 GMT+0000 by Neil Godfrey. This entry was posted in Christian Origins, Historical Methods and tagged Historicity of Jesus, PZ Myers, Tim O'Neill. Bookmark the permalink. Occam’s Razor – parsimony – says the sources that Tim O’Neill appeals to are just theological narratives that are not based on known valid or factual sources. A few years ago I started looking into the question about whether there was an historical Jesus behind the blatantly mythical Jesus we find in the earliest literature. Over the months and years of considering the arguments and evidence on all sides, I’ve come to the conclusion that it’s very likely Jesus only existed as a literary figure. Part of what pushed me to that conclusion was the way partisans of the ‘orthodox’ view that Jesus did exist, either as a god or a man, relied so heavily on the presumption that he existed. That just strikes me as a reversal of the burden of proof. Another thing which bothered me was all-encompassing hostility toward the ‘myth’ hypothesis and vicious invective hurled at anyone who even expressed ‘agnosticism’ about whether there was such a man or not. Those were the same two reasons that influenced me. The two seem to be related. When pushed over the question begging “they” all too often simply responded with hostility. Perhaps it’s because I have only just a few hours ago completed a fascinating book by a French scholar that I did not know when I started reading would come to the conclusion that Christianity did not begin with a historical Jesus. But most interestingly his argument for Christian origins was commended as worthy of study by none other than Jacob Neusner. Neusner published RM Price’s midrash article, so he seems to like that sort of thing. Can you point me to Neusner’s publication, please? Price, Robert M. (2005). “New Testament Narrative as Old Testament Midrash”. In Neusner, Jacob; Avery-Peck, Alan J. The Encyclopedia of Midrash: Biblical Interpretation in Formative Judaism. 1. Leiden: Brill. pp. 534–573. ISBN 9789004141667. • Is it the following? • Reprinted (2011) in The Christ-Myth Theory and Its Problems. American Atheist Press. ISBN 978-1-5788-4017-5. Per channel “Fishers of Evidence”. YouTube. [Description] A series of videos on the Jesus myth v historicity debate, without taking sides I hope! Cf. “Fishers of Evidence Gets Confused about Math”. Richard Carrier Blogs. 18 March 2017. • The Fishers of Evidence series of videos is a much better on the Jesus myth v historicity debate then Tim O’Neill’s treatment of the issue. But currently there does not appear to be a video on the Jesus agnosticism viewpoint. • “Jesus Historicity v Mythicism: Mythicist view of the Gospels“. YouTube. 11 March 2016. 1. Historicity Agnostic: The historical evidence is too patchy, too minimal and too ideologically tainted to be able to reach any conclusions about the Jesus figure of the Gospels. Thus asserting anything further than his existence is going beyond what the evidence allows. The most we can say is — “we do not know”. 2. Ahistoricity Agnostic: We should not assume things to exist unless we have sufficient evidence to reach that conclusion. Thus in the absence of sufficient evidence, we should assume there was no historical Jesus. This whole series of posts is just too frustrating to participate in, because its an argument between people that don’t know what they are talking about and stuff that’s just plain false keeps getting spouted and goes unaddressed because the other people doesn’t know enough to engage in the debate. It’s two intelligent but ignorant people spouting nonsense. And for what it’s worth, I mailed a copy of my book to PZ at his university address, about two weeks ago. Either he never got it or has no interest in it. Appeal to ‘Occam’s Razor’ (parsimony) is a bait and switch tactic which is really an appeal to tradition (of belief in a Jesus-man who was deified), which, in turn, also puts shade on the alternative proposition that Jesus is a literary construct. Also , regarding the whole “occam’s razor”, I address this more directly in the closing of the second edition to my book. Once the 2nd edition is close to getting published I’ll just post the new material on-line for all those that bought the first edition. Anyway, the basic point is that in all of the pre-Gospel material, namely the epistles of Paul, James and to the Hebrews, there is no description of teachings or deeds of Jesus. There is nothing that describes why a person would be worshiped. The Jesus described in all of those early works is clearly a god, he is “the Lord Jesus Christ”, who can destroy the world, create a new world in heaven, overcome death, bring divine justice to the world, absolve people of all their sins, etc. Clearly these are the reasons that the pre-Gospel Jesus was worshiped, and all of those things are attributes of a god (or demigod or archangel or what have you), not a person. There is no discussion of the worship of a pre-Gospel for Jesus for any reasons other than godly divine powers. If the “real Jesus” is “just a person”, then why would this real Jesus have been worshiped? Paul says he worships Jesus because he overcame death and is capable of absolving believers of their sins and giving them immortality in a perfect world. What possibly could a real person have done to inspire the belief he could do those things? James says to believe in Jesus because he will bring divine justice to the world. Hebrews talks about absolution of sins for the world. None of these reasons why Jesus was being worshiped talk anything about teachings or deeds of a person, they all talk about divine powers. The Jesus of the Gospels, again, was worshiped due to belief in his divine powers. There are no real teachings or meaning even in the Gospel of Mark, as Dykstra also notes. GMark mostly presents mysteries that are never revealed, and what anyone may try to take away as “teachings” from Mark are really from Paul. Absolutely. Committed Christians who worship Jesus even today get benefits from it. Talking about it and studying the Bible doesn’t do it – it’s devotional practices including prayer that does it. This is not something that any atheist wants to hear, and it’s not something that the organizational church wants to hear either. It is interesting to read Larry Hurtado’s case for a “very early” divine Christology. The evidence of course really is on his side. Unfortunately I cannot help but notice that Larry seems to find topics and arguments that cohere so very well with his own personal Christian beliefs. Challenge his arguments or assumptions and his response is as likely to be indignant hostility or condescension as it is reasoned debate. Yeah, in terms of Occam’s razor, you have to either believe that somehow a group of people were led to believe that a normal person was able to “overcome death” and had obtained massive godly powers, or that a group of people were worshiping the idea of a divine being who was later cast in a story as a real person. Oh, and also the people who worshiped the normal person who they were convinced was a god didn’t write down anything about what this normal person said or did. Clearly Occam’s razor is in favor of the second position. I don’t know if I’m being naive, but I also find myself thinking that the mere existence of the various gnostic-like beliefs that emerged in relation to Christianity screams against a historical Jesus as the starting point. How plausible is it that such beliefs about Jesus arose from sects dedicated to a historical figure? On the other hand it seems very plausible that a historized figure who was depicted as divine (yes, Gospel of Mark, too) should at some point come from “the riotous diversity” of beliefs. And it is simply not certain that even Justin Martyr around the mid second century knew of the canonical gospels in their present form. He is forever attempting to prove and portray his Jesus from the OT. Regarding JM, keep in mind that just because someone may not have had texts in hand doesn’t mean they didn’t exist yet. This is something that gets me about the way people deal with these texts, often acting as if others should be aware of all the points in a text as soon as it came into existence. It could well be that JM never actually got his hands on a written copy of a Gospel, but that doesn’t mean that he wouldn’t have been influenced by their narrative. It’s certainly possible for it to have taken years (even 20 or 30 years) for a Gospel text to have made its way around to various communities, but for impressions from it to have preceded the text by way of mouth. I wonder if Mark was in the hands of some group like the followers of Basilides and hence Justin’s failure to accept its narrative. Justin appears not to know of Paul very likely for a similar reason, and if, as you argue, Mark’s Jesus was based on Paul, well…. Mark calls what he is writing the “Gospel of Jesus Christ,” which flies in the face of RG Price’s hypothesis. Because gospel means good news. RG Price says Mark is being sarcastic by using the word “gospel.” Please! This is why mythicism is not to be taken seriously. To mythicists, nothing is what it seems. Paul says Jesus is of the seed of David, so Carrier invents the scenario of God stealing David’s sperm and keeping it in a cosmic sperm bank (even though the text outlines none of this). Paul says he met Jesus’ brother, but mythicists say no – it’s not what it seems. Do you let a disagreement on one point lead you to reject everything an author has to say? I get something out of nearly everyone I read even though I find myself in disagreement with much or some of what they say. If the author has an argument do you address the argument or just the conclusion as nonsense? Do you lump all mythicists together? If you reject the whole thesis because of Gqlatians 1:19 then it looks like you are not interested in the arguments but only in an uncritical naive reading of the texts as we have them and shun any suggestion that there could be any valid argument to undermine such a reading. That’s not how genuine historical inquiry works. Have you addressed my own argument about Galatians 1:19? If we are going to read the texts uncritically then there is simply no debate or discussion to have. I think R.G.Price has the right to suppose it is a sarcastic use of εὐαγγέλιον. Up to that point in time the term was habitually used in the Graeco-Roman world in connection with the coming of a (new) ruler who brings order, peace and prosperity, so effectively a Caesar. If you have a problem with that historical fact then yóu are defending the concept that nothing is what it seems, as you propose then that the story in reality depicts a bringing of order, peace and prosperity. Please! It is just nowhere in the story and the sorry fate of the main character and the enigmatic ending that supposes him stealthily retreating to where he came from, having accomplished nothing, do not exactly signal a victorious and glorious ruler and bringer of peace. Unless you are a Christian apologist of course because with God all is possible and you have to be foolish to become wise. On this point I am with R.G Price wholeheartedly and I don’t know for sure but I don’t think he sees his thesis as being in the Mythicism class. The Good News of Jesus Christ according to Mark promised fasting, struggles against persecution and temptations, giving up all one’s possessions and leaving family and friends, and facing prison, torture, death. According to Matthew it promised not peace but the sword. The evangelists used the political term “gospel” (used of a new heavenly reign of emperors) in an ironic twist, sarcastic if you will against the political use of the word, to mean a good event that would only emerge the other side of persecution and death. “Nothing is what it seems”? Nothing? Or do we mean that Romans 1:3 and Galatians 1:19 are everything we need to scoff at mythicism? Matthew as competent and inventive plagiarist saw the problem in the sarcastic rendering of the term in Mark and was the first to bend it into the Christian apologetic sophistry that was needed to turn a humbling defeat into a glorious victory. The main problematical consequence is that all subsequent readers read Mark through the rendering of Matthew. I take the early tradition of Matthew’s primacy very serious and consider the possibility likely it was the first widely circulating gospel for a long time until original copies of Mark resurfaced and were mistakenly seen as an inferior derivative of Matthew with strange wording that had to be explained away, we are lucky it survived as it has, the original meaning is preserved and understandable if you block out Matthew, Luke and John completely. I see comedy, R.G.Price sees political allegory of some sort, probably both are present and some day we will see the whole picture clearly. The passage being referred to in the opening is about God punishing Israel. In the whole story Jesus is angry, rejects everyone around him, tell all his followers they are fools, he’s betrayed, there are no real positive lessons, and in the end he’s killed, with a Roman centurion being the one to recognize him as the son of God, while none of his followers did, all of whom abandoned him in his time of need. That the “good news” was sarcasm is pretty obvious. This isn’t just my conclusion, many biblical scholars conclude that GMark is an ironic tragic comedy. There was no genre called “a Gospel” when this story was written. As Martin said, it was really the later stories, copied from Mark, that came to define the genre, into which Mark got lumped. GMark was always interpreted through the lens of the other stories, which completely transformed the meaning of the original narrative. The “gospel” is meant to be a celebration of Jesus. There is nothing sarcastic about it. Your entire idiosyncratic interpretation is completely wrongheaded. Evidences have different weight when assessing. For instance, the result of a final exam carries much more weight in assessing a student’s final mark than does a short quiz. And you yourself know how much weight the James, the brother of the lord passage in Paul carries, which is why you keep producing blog post after blog post to try to discredit the straightforward reading of it. I think you have seriously misunderstood and inadvertently mischaracterised the mythicist arguments you mention. No one argues that a bunch of literary allusions and influences in the gospels proves that they are mythical stories. No-one that I know of. And I don’t think you can point to anyone who argues such nonsense, either. Instead of just pointing to the number of blog posts where I have addressed Galatians 1:19 and claim that their number indicates how false they are – would you say that historicist rebuttals that are even more numerous are false because they are so many? — why not actually address the argument in just one of them? That would be a more credible response, I’m sure you realise. John, I may be misreading you but you seem to sound a bit heated or indignant over mythicist arguments. If so, I don’t understand why. The question of historicity or myth doesn’t mean a thing to me personally. I can accept people having different viewpoints. What bugs me is when one side starts attacking the motives, character and intelligence of the other. And I mean that whether it comes from the mythicist or historicist side of the debate. The ‘weight’ that passage carries is negated by the weight of other information, such as no other references at all in the NT books to James being the [blood] brother of Jesus. There are various contradictions about James, such as Matthew 27:56 where James and his brother John are the sons of Salome, a female follower of Jesus. … all traditional Christian understanding of these individuals is that the James and John mentioned in the letters of Paul are a different James and John than the James and John mentioned in the Gospels … the James and John who are Jesus’s disciples in the Gospels are obviously not related to [the James in Paul’s letters]. Price, R.G.. Deciphering the Gospels: Proves Jesus Never Existed (Kindle Locations 996-1005). Lulu Publishing. I think John is overlooking the fact that even Carrier assigns Galatians 1:19 a probability that strongly points against mythicism. By taking a naive reading of a single text while setting aside the mountains of evidence against that naive interpretation is simply setting aside completely all critical reasoning. Not even biblical scholars go that far — except when it comes to digging in on a few verses when confronting mythicists! The idea that ‘the various gnostic-like beliefs…emerged in relation to Christianity’ is likely to be a misrepresentation in many if not most cases of the various gnostic-like beliefs. It’s like the heretic/heresy accusations: a later trope used to deny the milieu out of which Christianity arose. Various scholars of the gnostics and gnostic-like groups and their texts have said that. There is an English-language audio-book titled The Jesus Mystery: Astonishing Clues to the True Identities of Jesus and Paul, and I think there is also a print version by the same title (perhaps published by Robert Hale). It seems to make some different propositions to her latest book (‘A shift in Time’) such as, as Robert M Price outlines in a review, that ‘Paul was Jesus was the Egyptian was Ben Stada’. Einhorn thus makes sense of the extensive parallels between the Passion journeys of both Jesus and Paul in Luke-Acts, not that it all happened twice, but that the second telling of the story in Paul’s case is a hint that Paul is the same character who underwent the process in Luke. Einhorn notes other, smaller parallels including the Galilean birthplace of Paul according to Jerome and the similarity of Paul’s being trained as a youth by Gamaliel and Jesus engaged in dialectic with the elders and scribes in the Temple at age 12. 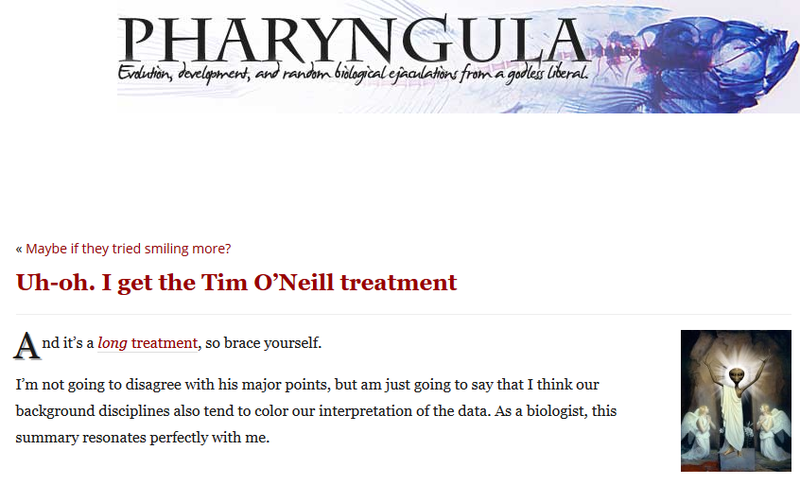 I really like it when PZ Myers talks about biology and evolution. And nothing else. So Paul would have believed this to be true information revealed through scripture, but would also have understood that the referenced eternal throne had clearly not been established on Earth (which would have been obvious to Jews/Christians living in the first century). So where was it? The answer is where Jesus resides post resurrection, something any Christian today should be able to tell you: in the heavens, at the right hand of the father, upon his cosmic throne. So if the second part was (and is currently) determined by Christians as referring to a heavenly, cosmic throne, then it actually follows that the first part is also referring to heavenly, cosmic events. Thanks. I caught up with it. Will post a response in a day or two.